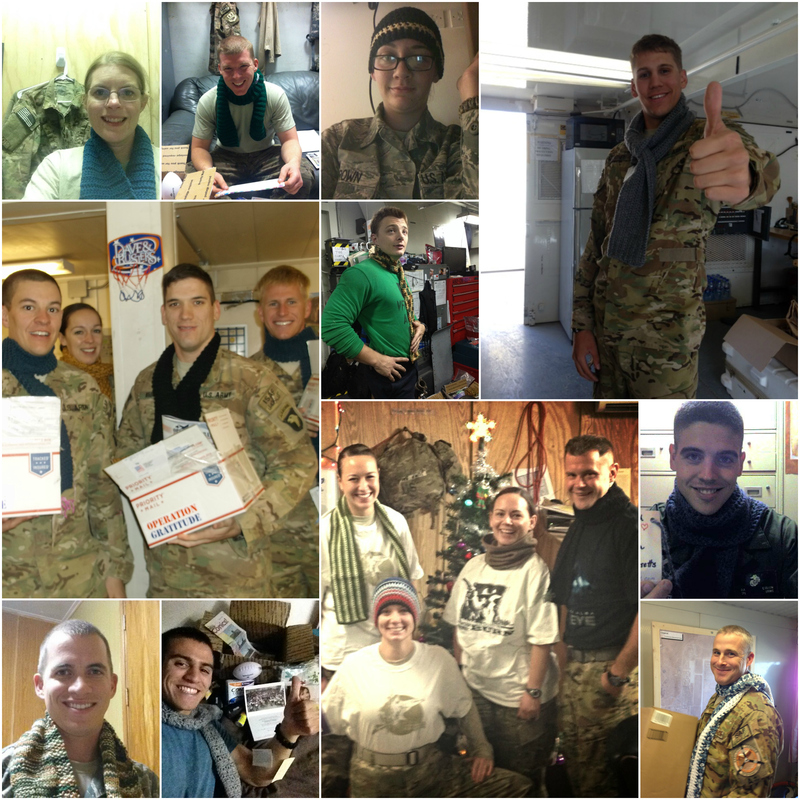 Operation Gratitude’s Scarves for Troops Program is more popular than ever thanks to the dedicated and generous support from talented people like YOU all across the country! These handmade-with-love gifts are treasured by all who receive them! If you have knitting or crocheting skills, we invite you to join us — starting now — so we can include one of these precious gifts in each of the winter-time care packages we send! Want to get started? Here are a few Frequently Asked Questions…and Answers! Is there a pattern for the scarves and hats? There is no specific pattern to follow so feel free to use your own — or you can find some here: PATTERNS. We do recommend that you keep them simple and perhaps use slightly larger needles so more can be made! Please keep your scarves within our size restrictions (no larger than 4″-6″ wide, 48″-50″ long) so they fit into our care packages. No fringe. You may notice that the size guidelines are a bit smaller than in the past. Do NOT be concerned if yours are a little wider or longer. It is still absolutely fine. Our scarves that are a bit too large for our regular boxes are enjoyed and appreciated by our Wounded Heroes or our Veterans. What yarns and colors should we use? Any soft yarn is fine and any color will be accepted, but if possible please keep the colors on the subtle side–blues, browns, olives, grays, maroon, and black are all good choices, as well as appropriate for male and female troops! Stripes using these colors or multi-colored yarn is acceptable. NOTE: We have reviewed our policy with our Military advisors and have been cleared to accept scarves and hats made with a red, white and blue color combination. Will I get a letter of acknowledgment from Operation Gratitude? Yes, we will keep track of all the scarves and hats you send or deliver to the armory, then send you a thank you letter within 12 weeks. If you want confirmation of delivery of your shipment(s), please use the tracking system provided by your shipper. Find helpful shipping tips, cost-saving ideas and important information here: Donation & Shipping Info. If you want confirmation of delivery on your shipments of item donations prior to receipt of our acknowledgment letter (allow up to 12 weeks), please use the tracking system provided by your shipper. Can I drop off my donations in person? Yes, donation drop offs, product deliveries, and recycled phones are accepted during all Volunteer Hours at our facility (“The FOB”) in Chatsworth, CA: Monday – Friday, 9 a.m. – 4 p.m. When do you accept donations of hand-made items? We can accept them year-round. 1. 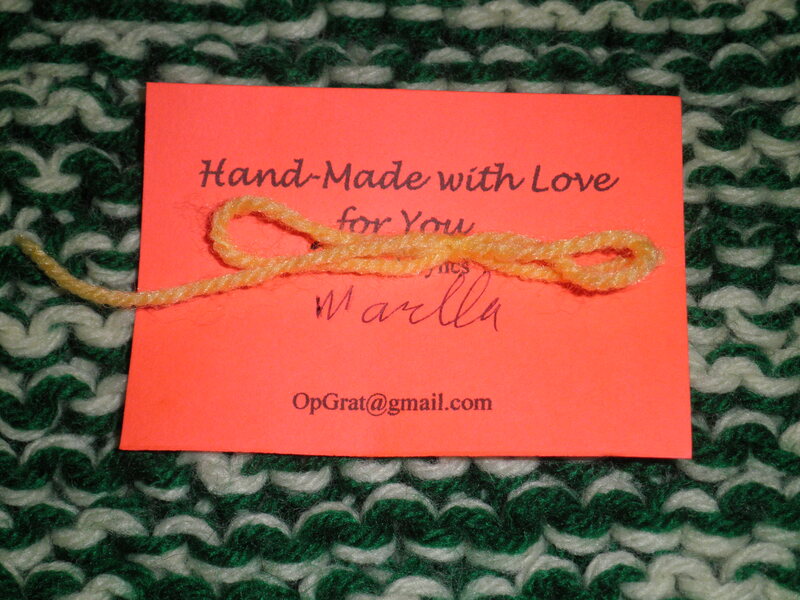 The best way to attach your personal notes to your scarves is with a piece of yarn through a hole in the note and then tied to the scarf (shown, left). Include your contact information — an email or “snail mail” address — so the recipient can send you a “thank you” if they have time! 2. Many of you are thoughtful to place each scarf in an individual plastic zip-lock bag. That is not necessary. Instead, when mailing to the Armory, please place scarves all together in one large plastic zip-lock or draw-string bag so the scarves remain clean and dry during transit to us and while waiting to be shipped to the troops. 4. Be sure to visit our Pinterest board for more inspiration and ideas. Our hope is that you will be inspired to keep your hands and needles busy making these gifts all year round! Our goal is to send 50,000+ every year!! We definitely need your help. This entry was posted in Uncategorized and tagged crochet, donations, handmade, knit, Military support, Operation GRatitude, Scarves for Troops, volunteer. Bookmark the permalink. My family has many members who have served: my father, 22 years in the Army, 2 1-year tours in Vietnam (now deceased); two brothers who served in the Navy (older brother deceased); my brother-in-law is a Marine veteran and also served in Vietnam; my first father-in-law served 30 years in the Air Force, was a WWII fighter pilot, and served in the war with Korea (now deceased); my husband is an Army veteran, was a Combat Medic in the first desert conflict; and my husband’s father was an Army veteran, and served as a recruiter, as well (now deceased). I am a proud Army “Brat” and love my connection to our Armed Forces! I have been looking for a way to give back for a long time, and this cause just came up on a crochet page I belong to on Facebook. What a great way to show our troops we care, we think about them, and appreciate all they’ve sacrificed for us! I can hardly wait to get started! Thank you for this wonderful opportunity. Thank you for your support, Robin! I am very interested in making scarfs. I hope you are still taking donations. I have several friends in the local Senior Center interested in knitting scarves for our soldiers. Can donation forms be sent in the packages to you as some members to do not have computers etc. Yes, that would be totally fine — thank you! Please pass our thanks along to your friends at the Senior Center, too! If you have additional questions, please send an email to Info@OperationGratitude.com. I would like to start doing this once I am healed. I just got this site a few days ago and have already finished a scarf! I am honoured to make something for these heroes. THANK YOU, Sherry! We are grateful for your support! Have been doing this for 2 years. However I find the shipping cost high, $1/scarf”. How does everyone send their packages? Can the scarves donated be larger than 4 x 36 inches? Yes! We won’t turn any scarf donations down. Thank you! I was in Joanns looking at yarn next a young lady doing the same thing. She mentioned Op Grat and the rest is history. Not only are our troops Angels, but sometimes you find them in the yarn department.. I have 2 dozen ready and will be sending.. I read your comment that you are doing this also to honour Captain Luis Carlos montalvan. We have lost a beautiful man he has left a legacy behind of advocacy and we must keep his story alive and keep telling people about him and his service dog Tuesday. Looking forward to donating for next year. Looking forward to being a part of this program. I have a son-in-law who has finished 4 tours as a Marine, and may be going again; two grand-sons who are in the Marines; and we lost a grand-son (Marine) in Afghanistan. Kathleen, we are honored by your support and deeply grateful for your family’s service and sacrifices. Words don’t seem at all adequate — but THANK YOU. I have injured my hands and am unable to knit anymore. Would loom-knit scarves and hats be acceptable? I haven’t tried it since my injury but would love to contribute if possible. Yes — we accept loom-knit hats and scarves, too. Thank you for your support! If you have additional questions, please send them to Kelly@OperationGratitude.com and she will reply asap. I have been looking for a service project for a while now. I was so happy to see this in my news feed on facebook. My husband is getting ready to retire after 19 years in the Army so the military has been something near and dear to my heart for years. I’ll miss out on making any scarves this year, but plan to send a bunch next year. Thank you, Amy! We’ll look forward to receiving those scarves whenever you’re ready to send them. 🙂 Please pass along our sincerest thanks to your husband for his service in the U.S. Army! I am so excited to get to be involved with this program! I am so amazed with this scarf program! And I will be most definitely doing this! I have been working on some scarves here n there so I will be so happy to make more!! I am also going to be recruiting some of my friends and family! Even if they help in donating some yarn or time I’m going to take them up on it plz let me know what other handmade products you are in need of and I will get recruits for that! Thank you all for this opportunity cause right now I’m dealing with Bell’s palsy and I need to keep myself as busy as I can! Thank you so very much, Roberta — we are grateful for your support! Scarves, hats, and paracord “survival” bracelets are what we send the most — you can find more ideas on our “Handmade-with-Love” Pinterest board. Please let us know if you have more questions by sending an email to Kelly@OperationGratitude.com and she’ll get back to you asap! Thank you again! You all are very welcome! I’m happy to do this for them as the do so much more for us protecting us and keeping everyone safe! What a wonderful idea! I’m an Army National Guard soldier and the wife of a disabled veteran, and I would love to help. My question is, I generally arm knit instead of using needles, so the scarves are a little bulkier and the loops are bigger. I can either sew the ends together to make an infinity scarf or leave them open like a traditional scarf. Will this be acceptable? Thank you — and your husband! — for your service! Thank you, too, for your interest in making scarves for our care packages. Your question is a good one and I’ve forwarded it to Kelly@OperationGratitude.com. She will get back to you asap! Thank you again! so happy I saw this this morning..I will be sending scarves your way !! I can’t wait to start working on hats and scarfs for the troops. This page just recently came up on my Face Book news feed, and I was excited to see it. I have my own crochet page which you can find on FB (left 2 crochet). I am the mom to 3 AF sons and 1 Navy son-in-law. I call them my Blue Stars. Two of them are currently deployed, so I understand more than I used to about the needs of our service men and women. I will begin crocheting scarves this weekend! Is it ok to crochet hats as well? Yes, absolutely — hats are great, too! We have some suggested patterns linked in the blog post, but feel free to use your own patterns. We are grateful for your sons’ and son-in-law’s service and hope the two who are deployed are signed up to receive one of our free care packages. If you have more questions, please let us know: Kelly@OperationGratitude.com can answer all your “handmade with love” questions and you can email Info@OperationGratitude.com for everything else. THANK YOU for your support! I just found this site, What a great idea. I love it. Is it too late to make and donate some scarfs? I’m kind of new to crocheting , but would love to try and make some, if it’s not too late. It’s never too late! We accept them year-round. Thank you for your support! If you have more questions, please let us know. Send an email to Kelly@OperationGratitude.com and she’ll get back to you asap. Is there a specific color or type of Yarn you prefer? Neutral colors and color combos that could be worn by both men and women are best, but we’ll gratefully accept ALL colors. Thank you! I’m very interested in knitting scarves and hats for our troops! I have so much yarn that I was wondering what to do with and now I know! My son currently serves in the US Navy! We are grateful for your son’s service, and we hope you’ll sign him up for one of our care packages if he deploys. Thank you for your interest in our Scarves for Troops program! Thank you, Lee. We are grateful for your support! How do we get the boxes to ship scarfs in. I have some that I can donate but they have matching ear muffles and not hats. I had them made up to donate to a shelter. Don’t remember what type of yarn for sure but I think wool. Is there any way to make afghans/blankets for the soldiers? I know space is limited with the scarves, but I’m sure they can always use a blanket as well. I have some made up with matching ear muffles. I don’t have any way to print off the donation form. I will get them in the mail. I think all are made with wool. I have cats that love to “help” me crochet. Due to allergies, if they are launderer before sending is that acceptable? I have an alternative place without pet hair to store, pack, ship, launder, etc. I belong to Knitters for Charity in Hudson and Bayonet Point, Florida in the winter. Love making scarves. Will be sending them. I belong to the Knitters For Charity in Hudson and Bayonet Point, Florida. Will be making scarves right away. Right now I am in Massachusetts. Thank you for the opportunity. Do we have to use the donation form? I have no way of printing it out. If you can write out and provide us with all the info we’re asking for on the donation form, it doesn’t have to be the exact form — that will work, too. We want to be able to acknowledge your donation with a “thank you”/receipt. Please let us know if you have more questions by sending an email to Info@OperationGratitude.com Thank you! Do you accept scarves from Canada? I would love to help but I only have my smartphone and can not print out ur donation form would tht be a problem? I did not know this program existed, I am a veteran and a military mom so would love to help in some way if I can. Thank you for your service, Kelly, and thanks for your support! Did not know this program existed. I crochet and will definitely get some together. What a great idea to show the brave men and women that we truly care and are in our prayers. Thank you for your support, Linda! Please let us know if you have any questions — you can send us an email: Kelly@OperationGratitude.com and we’ll get back to you asap! Thanks again! I will definitely be participating this year. Sounds like a terrific idea and I want to participate. When do you want the items sent to you, i.e., when do you start assembling the packages that would include these scarves? Thanks! I would like to participate. I am a 60% disabled veteran. I have a lot of yarn, to crochet with. Great idea. Will get my Knitting Club working away! My friend and I would like to crochet and donate some scarves. One question, do you also accept fingerless gloves? Yes, we do — fingerless gloves would be great. Thank you for your support! Many thanks for your kind and generous support! So excited to see this program. I work for a non profit in southwest Va. so I am always looking for good programs. I am in the process of trying to get several programs going at the moment, but I cant wait to get myself and my friends started on this one. I live in the Piedmont of Virginia and I am interested in what other programs your non profit group is doing, since I am looking for new opportunities to help others. This organization is awesome! I had a great time making scarves and it is so cool to know that they are going to somebody who is protecting me. You guys rock!!! I got a group of about 10 people we have been making the scarfs. And I would like to know if I can drop them off at the office? Thank you so much! We appreciate your support. We can accept drop-off donations 9am to 2pm, Monday through Friday. Check here for more info: http://bit.ly/OpGratDonationInfo. My Brother bought me about 15 skeins of yarn and I am making some scarves with some of it. I’m wondering if it would be OK to make some lapghans for our Wounded Warriors? Please let me know if this is OK. Thank you for giving me something to do for our Country. God Bless You and keep up the great work! Jeannette, thank you so much for making scarves for our care packages! Lapghans would be wonderful to make and donate at your local VA Hospital, but they’d be too big for our boxes. If you have any additional questions, please send them to Info@OperationGratitude.com Thank you again! Thank you, Ann, for your kind support! I bought yesterday wool. This was something new for me, to find subtle colours and a little bit thicker one. But I got it. Normally I use more vivid colours, socks and blankets/blankies. At home I have little metal lables in heart shape “Made with love”. Is it ok to put them on the scarves ? I’ll start tomorrow or Saturday. Thank you so much for your kind support! Yes — those little metal labels should be fine. Thank you again! Hi i’m in the UK and would love to get involved in something like this. Do you know of something similar in the UK, i’m just thinking about the cost of sending items to you. I found two possibilities, Jeanette. Check with Support Our Soldiers and Soldiers Off The Street — they may welcome your handmade donations. I see one picture that appears to have a cowl instead of a regular scarf. Is a cowl acceptable as well? Hello, I think this is great, I would love to do something special, I don’t know how to knit…yet… but I am a musician, could I send a CD single in with my friends scarves? That would be great, Michol! Thank you! thought this would be great Idea only not sure if Ok ? Thank you, Erica! We can accept those Beanie Babies, too! Here’s more info: http://bit.ly/BeanieBabies We appreciate your support! You’re welcome! Thank you for everything you do for our Warriors! Sharing this with you today. Sharing hats and scarves soon. Thanks for this post. I knitted hats for the troops one winter. Nothing more rewarding. Getting started on scarves today!!! Thank YOU for supporting our troops!! I’m loving this project! We are 25 women strong (and growing) crocheting away to donate to the troops this year! How wonderful! Thank you for telling your father-in-law about us! Please pass along our sincere thanks to him for his kindness and generosity. If you knit or crochet, or know someone who does, here is an opportunity to send a heartfelt “Thank You” to a serviceman of woman.